A swollen eyelid can be caused by a number of different reasons but the most common causes include allergy apart from eye infections, an injury to the eye and sometimes trauma can also result in a swollen eye. In some cases like ocular herpes, orbital cellulitis and Graves’ disease, a swollen eye is just a symptom and indicates the presence of a problem that can result in sight loss in some cases as well. The swelling can occur below or above the eyelid on both eyes. The swelling is caused by the presence of excess edema in the tissues that are near the eye or can be caused by inflammation as well. It is imperative that you visit your ophthalmologist for a complete checkup in case your swelling does not go away in a normal period of time or is getting worse with the passage of time. Eyelid swelling can be caused by a number of reasons, most of which are not critical or serious to the overall health of a person, but in some cases a swollen eyelid also indicates a more critical or life threatening issue. There are a number of allergies which can cause swelling in the tissue around the eyelid. The allergic reaction which causes this swelling is mostly mild but sometimes the swelling is caused by a critical allergic reaction. The swelling can be caused by a reaction to dust or cosmetics or even pollen. 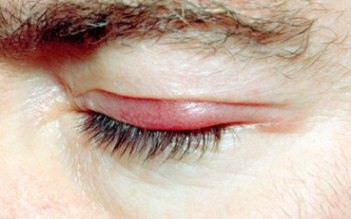 An allergic reaction to the bite of an insect can also result in a swollen eye. Such swelling is also indicative of reaction to animal dander. Penicillin or codeine can also trigger an allergic reaction which causes such swelling on the eyelid. A swollen eye can also be caused by an anaphylactic allergic reaction. Cellulitis is a skin infection which can result in swelling above or below the eyelid. A viral herpes infection can also result in a swollen eyelid. An infection of the sinus can also result in eyelids which are swollen. An eyelash follicle which has been infected can also cause tissue around the eyelid to become swollen. Mumps and Dacryocystitis are also infections which can cause eyelid swelling. Conjunctivitis which is also known as pink eye causes the eye surface to become inflamed. Apart from causing itching in the eye, conjunctivitis also results in swollen eyelids. Meibomian gland can become inflamed when infected by bacteria. Such an infection is called stye which also causes the eyelids to become swollen. Chalazion which is similar to stye in some ways also results when the meibomian gland becomes blocked. However, it results in a sebaceous cyst which is hard. The infection also results in eyelid becoming inflamed. Improper use of contact lenses or using them inappropriately can also cause an infection that result in swollen eyelids. A foreign object entering the eye can causes swelling of the eyelids. Surgery of eye or face can sometimes cause eyelids to swell. An injury to the eye is also a reason because of which eyelids can swell. Eyelids can also swell if there are burns on the face. Treatment of swollen eyelids is prescribed only after assessing the reason which has caused it. Eye drops are usually the first line of treatment that is given by ophthalmologists. In case of an allergy being the cause of the swelling, mild steroids drops, antihistamine eye drops and artificial tears are usually prescribed by the optometrist. Swelling of eyelids caused by viruses and infections is treated with antibiotics, antiviral eye drops and anti-inflammatory ointments. Home remedies can also be used for treating mild instances of eyelid swelling. Refraining from rubbing the affected eye, not wearing contact lenses until the swelling subsides and applying a cold compress over the swollen eyelid are some of the home remedies that you can use for this purpose. If the swelling does not respond to any of the conventional treatment methods and begins to worsen then it is best to see your eye doctor immediately. Get yourself tested for allergies and then stay away from the allergens and eye irritants that might trigger an allergic reaction like tea bags, cucumber and hemorrhoid cream. Don’t make use of eye drops that have preservatives present in them. Always your perfume-free and hypoallergenic make-up items to minimize the chance of an allergic reaction. Server responsed at: 04/24/2019 6:24 p.m.